Bro. Adrian was born into a family of born-again Christians serving the Lord in Jesus Miracle Crusade International Ministry. 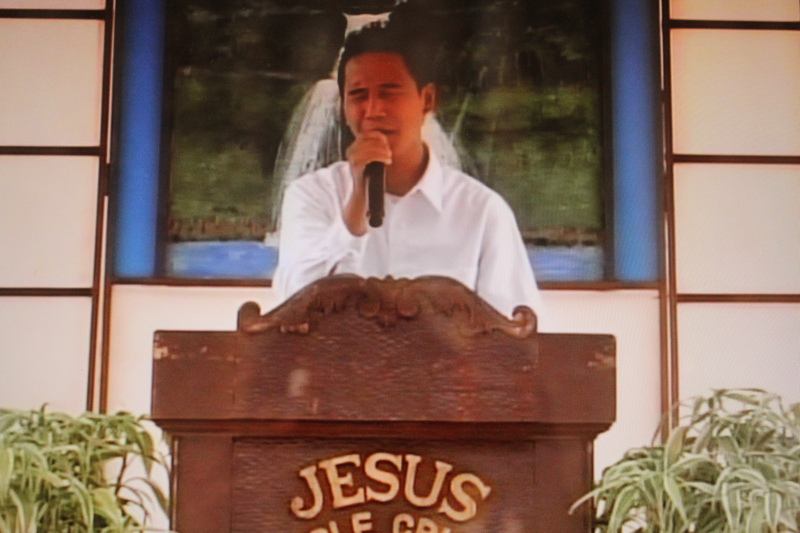 As a child, he sang in the Children’s Choir, and later on, in the Jesus’ Finest Generation Choir, until he became an instrumentalist in San Carlos, Pangasinan Outreach. Then he got married and started a family of his own. Life was hard for their young family, and the enemy took advantage of their circumstance. Bro. Adrian went looking for a job to support his family, but not one of those which he applied for hired him. Then someone offered him a job to play in a band in a bar and restaurant. The salary was really good and something that Bro. Adrian couldn’t resist. And because of their poverty, Bro. Adrian accepted the job to play in a band before people who are seeking worldly pleasure. He left his calling as an instrumentalist in church. Bro. Adrian embraced his new job with a new zeal. He became a servant to the world. Everyday, he was happy and content with the money he was receiving – it was more than he had ever dreamed of. This went on for a time – until God’s chastisement came and fell hard upon him. Bro. Adrian bought a motorcycle and he used it to travel to work. One day, he was on his way to work. A dog crossed the street and Bro. Adrian avoided him by pressing on the brakes but because of this, he and his motorcycle was flung into the air. But his memory of the accident ended there. He didn’t have any memory of how he landed (although he mentioned that he was thankful to God he was not run over by tricycles which ply the street) and how he reached the Pastoral House of San Carlos Outreach. When he woke up in the Pastoral House, he was told that he arrived in his motorcycle, but he couldn’t remember any of it. He was immediately brought to the hospital. He was in great pain and he couldn’t move at all. CT scan results revealed he had a big blood clot in the head and surgery was necessary. Bro. Adrian and his father traveled to Manila. He suffered a lot as he endured the excruciating pain the long journey brought. But when they arrived in Amoranto Stadium and he heard the whole congregation praising, the pain gradually eased and he felt relief. After the midweek service, he was carried to the beloved Hon. Pastor Wilde Almeda’s tent. When the beloved pastor prayed over him and laid his hand on him, Bro. Adrian saw a bright light and something very cold flowed down from the top of his head, and he felt all the pain leaving. After this, upon the advice of his aunt, they went to Quirino Memorial Medical Center for another check-up. Upon seeing his CT scan results from Pangasinan, the doctor told him he needed to be operated immediately – a dangerous operation since it might damage a part of his brain. But they decided to have the surgery anyway. When everything was prepared for the surgery, his father requested for another CT scan, believing that Bro. Adrian’s condition might have improved. The second CT scan showed favorable results prompting the doctor to pronounce that Bro. Adrian no longer needed surgery. The doctors gave him at least 2 months to fully recover, but after just over 2 weeks, Bro. Adrian had testified in the pulpit completely recovered.